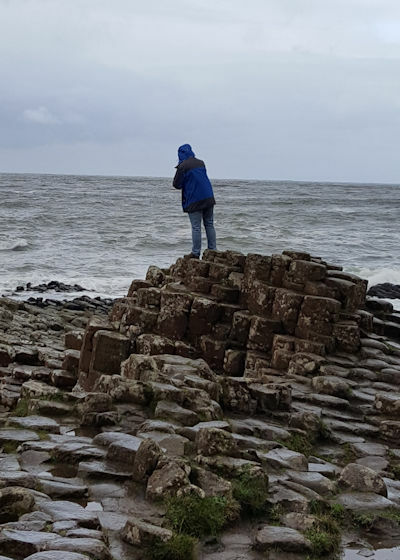 After leaving Belfast on Saturday morning, we drove north through the frigid countryside towards the Giant’s Causeway, a natural wonder that – despite its whimsical name – feeds the spirit as deeply as any cathedral. 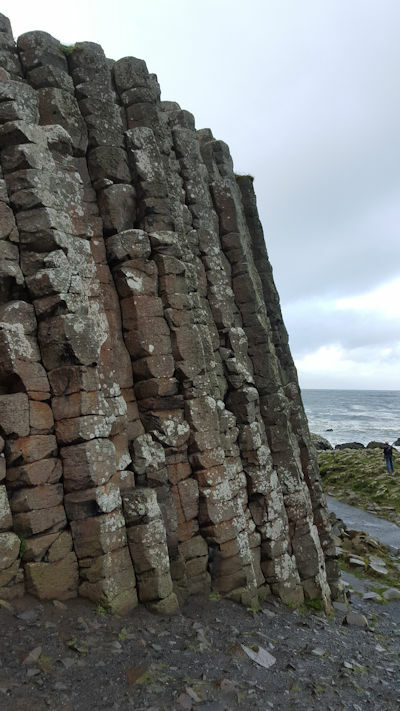 Each year when we go Iona, we take the boat trip out to Staffa to see Fingal’s Cave and visit the puffin colony, we marvel at the amazing geology that rises out of the sea. 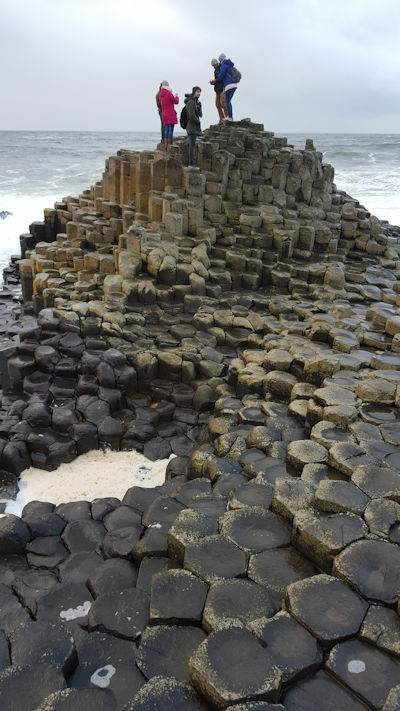 Tall, primarily hexagonal, prismatic columns fit together to form cliffs and formations at the water’s edge. Staffa in Scotland and the Causeway in Northern Ireland are two ends of the same geological formation, both beloved, both awe-inspiring. 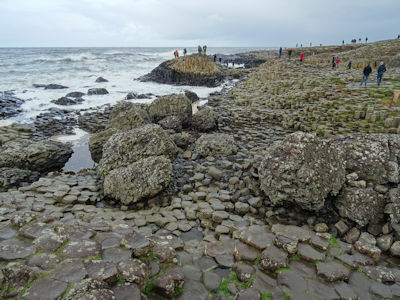 The Giant’s Causeway is well managed by the National Trust; although it is located in a rather remote corner of the country, large parking lots and a modern visitor’s centre have been built to control crowds and protect the fragile ecology of the area. There is, therefore, a long walk from the main entrance down to the shoreline, but for me that enhanced the transition from modernity to timelessness. Even on a bleak November day, with sleet showers passing overhead, there were a good few people. I would love to see the area and hike the cliffs on a sunny summer day, but I suspect I’d find the crowds quite off-putting. I loved the sense of really surrendering to Mother Nature in order to explore her sacred sites. Although there is a shuttle bus provided for those who need or choose to use it, we opted to hike both directions, and I felt grateful for my walking strength. I also felt grateful for a cup of hot coffee at the end of the trail! Legend has it that it was carved from the coast by the mighty giant, Finn McCool, who left behind an ancient home full of folklore and magic…. You’d love it!